Please read all instructions carefully before proceeding. 2. Clean the surface using a pressure wash of at least 2500 psi. If there is gum or other contaminants on the surface, remove with a clean wire brush. Alternatively, new concrete will require only a citric cleaner application. Agitate with a deck brush, rinse off thoroughly and dry completely. 3. Place mat(s) onto the application surface. 4. Mask off the area around the mat(s) with a good-quality duct tape, which bonds to the concrete better than regular masking tape. 5. Remove the mat(s) from the working area, remembering the exact position they were in. 6. Place the adhesive in the caulk gun, cut of 1/4" to 1/2" of the tube's plastic tip, and pierce the inner seal of the caulk tube. 7. Squeeze out a large bead of adhesive over one half the surface. 8. Using a serrated trowel, spread the adhesive to cover the entire masked-off surface (paying particular attention to making sure that the perimeter of the area is covered right up to the duck-taped edges). A 1-1/4 tube covers 4 square feet. FAILURE TO COVER ENTIRE AREA UNDER THE MAT WILL RESULT IN AIR SPACES AND POSSIBLE BLISTERING WHICH MIGHT INTERFERE WITH A COMPLETE BOND WITH THE SUBSTRATE. 9. Carefully place the mats back in their original position on the surface, making sure that they are not overlapping the duct tape. 10. WITH YOUR HANDS, PRESS OUT ANY AIR POCKETS FROM THE CENTER OF THE MAT OUTWARDS TO THE EDGES. 11. Lay a small, flat board (1 square foot or smaller) on the top of the domes and press down firmly. Move the board around making sure that all areas of each mat have been pressed down. Use the end of the board or another board to press down all areas in between the domes. Work inbetween the domes, from the center out, paying particular attention to pressing down all areas around the outside perimeter. 13. 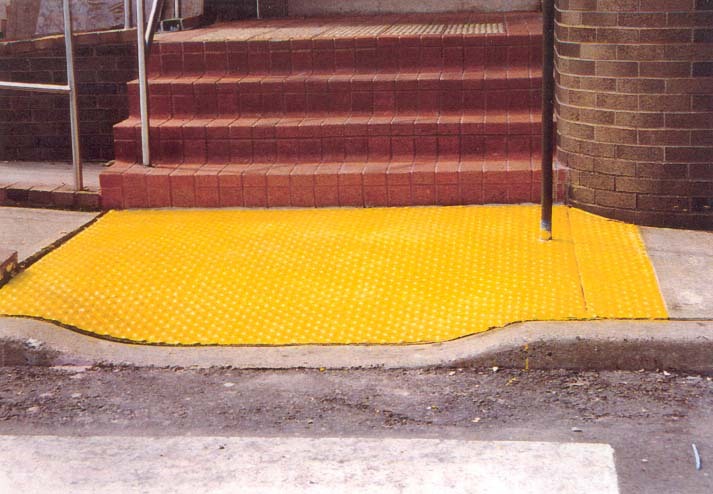 Let adhesive dry for at least 6 hours before allowing foot traffic. 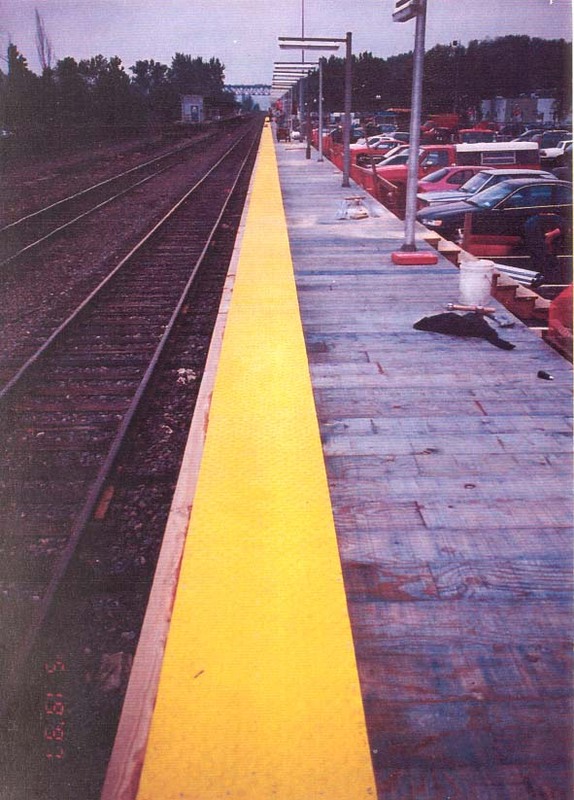 Your SAFTI-TRAX MAT™ Detectable Warning System is now complete! CAUTION: Do not apply when moisture-vapor transmission condition exists from the substrate, as this can cause bubbling within the sealant. Generally, in high temperature and humidity, apply in the cooler (latter) part of the day, when moisture travels away from the concrete surface.